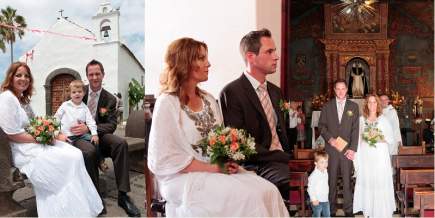 If you are thinking about a church wedding in Tenerife, there are plenty of beautiful churches to get married in here. From small and intimate little chapels surrounded by palm trees and Spanish ambience to big cathedral churches from the 16th century part of the UNESCO’s World Heritage. We can help you find the right church for your wedding in Tenerife and take care of the arrangements needed for your church wedding in Spain. All you need to do is tell us what kind of church wedding you would like and we will take care of the rest for you. All religions are welcome in Tenerife. Whatever your religion might be, we are happy to arrange your church wedding in Tenerife taking care of all the details and assist you with your marriage documents if needed, so you too can have a perfect wedding in Tenerife. We work with all major religions on the island and have experience organizing every kind of church wedding ceremony. 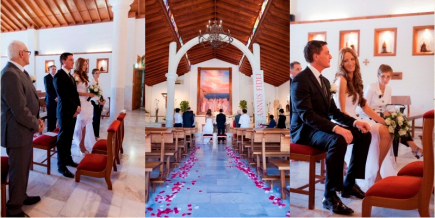 Over the years we have come to trust our little network of wedding priests in Tenerife because they have always offered beautiful ceremonies and our couples love it. Just let us know what kind of ceremony you are looking for.